Having a mobile version of an application has now become a must. 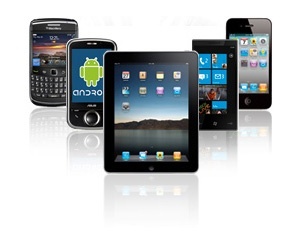 With mobile devices ranging from different OS platforms and tabletdevices – as testers, we have a lot on our plate!! Unlike our desktops, mobile devices come with various interfaces, from small screens that can be re-orientated when the device is physically rotated, touchscreen only devices to those which allow a combination of touchscreen and hard keypads, soft keypad only and not forgetting the various navigation methods such as hard keys and trackballs. Check for overall colour scheme/themes of the device. For example, Windows phone allow you to change the accent colour and background colours. Multi-touch such as : pinch to zoom and single touch. Long touch and short touch. For example, on some phones, pressing and holding an item will bring up a context menu, or a secondary function of a button. Button Size & Position: Buttons and icons should be large enough to be seen clearly and be clickable by a fingertip. Workflow: Use of radio buttons and checkboxes to minimize the amount of typing required, as this can be time consuming. Factors such as interaction with other devices and interruptions from the devices own functions such as incoming phone calls should be considered. Device Options such as Screen Timeout/Auto on/off: Is your application subject to screen dimming or automatically turning off even when it is actually busy? For example, you wouldn’t want your screen to dim or turn off while watching a slideshow of your photos. Screen orientation: You may be able to enable/disable automatic orientation switches when the device is rotated. Does your application apply the setting set on the device? Font: Does choosing a different font family, size, or style affect the appearance and usability of your application? Connections: Using one of the connections on a device, such as Bluetooth or Microsoft Direct Push (only on Windows Phone devices), could have adverse effects on your application. How does enabling/disabling Bluetooth or other connection types affect your applications behaviour? Not all activities can be realistically emulated, like switching network connections, or taking a picture or video. Some activities don’t work at all on emulators, like streaming video on a Blackberry emulator. Due to lower device power and memory, the application could exhibit slower performance overall when run on an actual device (versus in an emulator on your powerful desktop computer). If the emulator and actual device have different resolutions, your screens may not display as you expect. This applies to applications which require sensitive data storage such as banking applications, and how the application behaves under various device permission schemes. Mobile devices will no doubt continue to grow, and as testers we will need to keep up to date with the latest gadgets out there to keep on top of the latest changes in OS and functions belonging to a gadget. No doubt the device functions discussed in this blog will continue to grow.